In cold weather, the potential for burst pipes is high, and the results of frozen and burst pipes often result in extensive and costly property damage. Disconnect, remove and store outdoor hoses. Close all inside valves supplying outdoor hose facets. The Red Cross suggests installing specific products made to insulate water pipes like a “pipe sleeve” or installing UL-listed “heat tape,” “heat cable,” or similar materials on exposed water pipes. As a safety measure, keep a wrench stored near the valves and make sure you know how to shut off water valves if a pipe bursts. Inspect the area around the pipes for any air leaks and seal leaks. Check the heating systems to ensure proper functioning. During deep freezes, the Federal Alliance for Homes recommends allowing a slow drip from your faucets to reduce the buildup of pressure in the pipes. 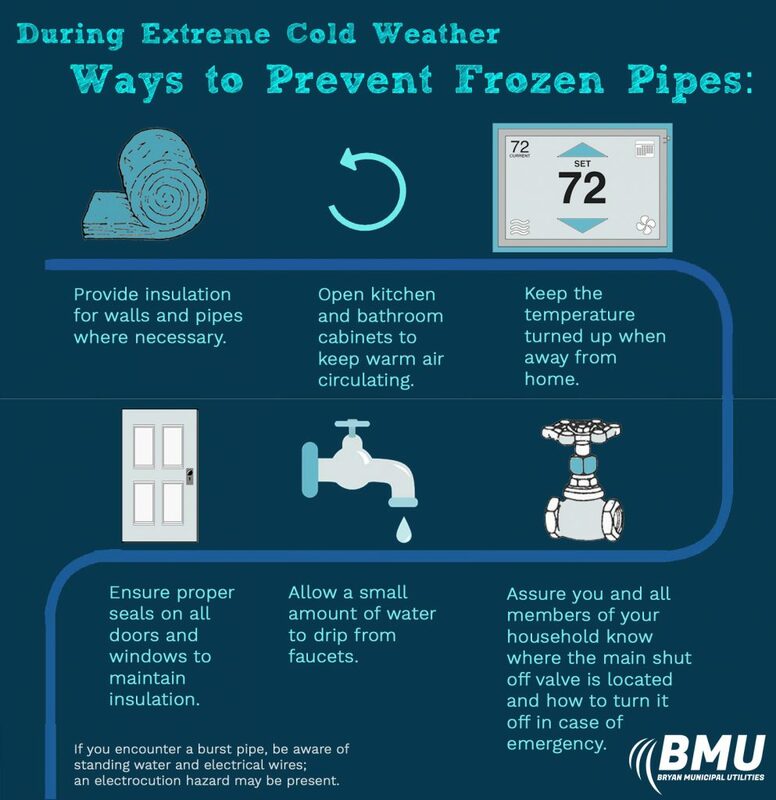 Even if the pipes freeze, the release pressure in the water system will reduce the likelihood of a rupture. Be sure you and family members know the location of all shut off valves; in the event a pipe bursts, you will need to stop the flow of water as soon as possible. For less frequented areas and unoccupied buildings, check heating and faucets two to three times a day to ensure there is no indication of frozen pipes. This is important as discovering a frozen line (no water flow) prior to the pipe thawing permits the opportunity to shut off the water before it leaks and may also provide an opportunity to thaw the pipe before the ice expands enough to split the pipe or fitting. Never attempt to thaw a frozen pipe with an open flame. You may be able to thaw a frozen pipe with the warm air from a hair dryer. Start by warming the pipe closet to the faucet, working toward the coldest section of the pipe.